Credit: "Mars and Venus, or Parnassus" (1497), by Andrea Mantegna (1431-1506). In the painting by Andrea Mantegna above—"Mars and Venus, or Parnassus"—we see a series of symbols passed down from ancient times. The symbols survived for several millennia. Some of them we can easily recognize, but all grew obscure over time: the primeval marriage of a goddess and a great warrior, the ceremonial union at the cosmic center, the location of this center—the axis mundi—atop the "world mountain" (Parnassus in one Greek tradition, Olympus in another). 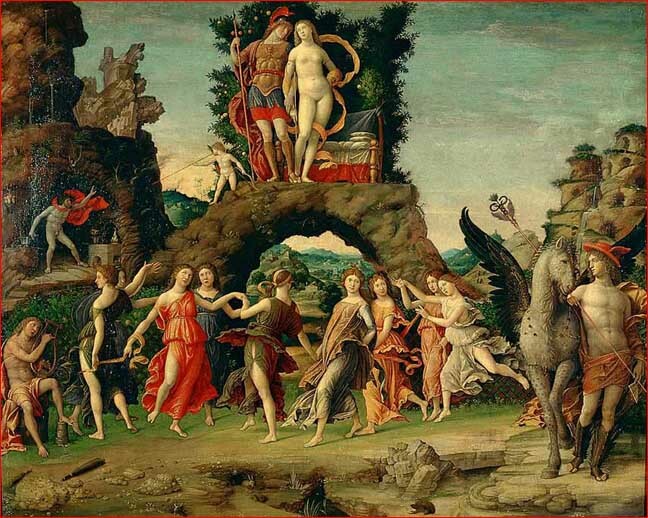 Complementary symbols abound: the warrior's feathered headdress, the goddess' naked form and long flowing hair, cupid and his bow, Hermes and his caduceus, the Centaur, the divine harp, and the dancing entourage of celestial companions. Of course, science today has no interest in the origins or meaning of such themes. And why should it? Was it not the first purpose of science to transcend the fictions of myth and superstition? Only when poets, philosophers and historians began to doubt the literalness of ancient stories did the leeway for science arise in human perception. But within today's theoretical frameworks, no comprehensive assessment of world mythology is possible. Accepted models in the sciences are based on “history-free” assumptions that exclude the ancient experiences that provoked the myths. Those assumptions cannot give us evidence about the ancient sky; they can only project models of the present sky backward, as if nothing changed over thousands of years. From this vantage point, the ancient narratives and cosmic images of myth are irrelevant and frivolous. Standard treatments of myth invariably trivialize the ancient convictions. The mythmakers are presumed to be ignorant. There is no secret worth exploring, no intelligible message to be extracted from the chaos of competing symbols. But this presumption leads to contradictions. It can be maintained only by ignoring facts that are undeniable. Comparative study of world mythology has revealed hundreds of archetypes or globally recurring themes. Comparative mythologist David Talbott calls these "the points of cross-cultural agreement, lying beneath the surface confusion of myth". Talbott suggests that the most costly error in standard approaches to myth is the attempt to interpret them through the lens of present experience. "No archetype answers to the natural world we experience today. In unison all archetypes speak for an unfamiliar world". The themes include a lost paradise or golden age at the beginning of human history, a polar sun presiding over this exemplary epoch, and a heaven-altering "Doomsday" catastrophe. “By penetrating to the underlying unity of myth, we see that all archetypes stand in intimate relation to each other”, Talbott continues. “The well-documented myth of the dying or displaced primeval sun, for example, cannot be separated from the legend of paradise. The Doomsday catastrophe means the violent end of this golden age”. And these are only two of countless associations repeated around the world. A fiery, longhaired or feathered serpent appears in thez sky as the world falls into chaos. But it is not just a serpent; it is also the "soul" of the dying or displaced god. And this serpentine "soul" reveals itself as the raging mother goddess, shrieking across the sky with unkempt hair, lamenting the death of her son or lover. For those who have pursued this study most diligently, world mythology is a storehouse of evidence and of promise. But the evidence demands a rigorous approach, one that will bring to light the substructure of human testimony without granting special credence to any regional story. Sadly, most investigations of ancient ideas ignore the essential ground rules for evaluating highly unreliable material. "No myth, anywhere in the world—however devoutly it might be honored by a particular nation or religion—can provide a reliable anchor for interpreting the myth-making experience", Talbott observes. "But the points of agreement between the cultures, when freed from modern assumptions, do provide a reliable anchor. The rational ground rules can then bring the core of the experience to light". Today, decades of investigation into mythology are converging with new scientific interest in the ancient world. The most promising bridge is that provided by "Electric Universe" theorist Wallace Thornhill and by plasma cosmologist Anthony Peratt. Both have devoted themselves to the rational meeting of myth and science—a deep appreciation for the ancient dramas, together with a new perspective on plasma and electricity in space.